As adults, we can understand that there are things we have to do not because they are fun or enjoyable, but just because they have to get done. Children—not so much. They want everything to be fun from getting dressed in the morning to bedtime at night! Of course, this includes brushing their teeth. But how in the world can a parent make teeth brushing fun? Your family dentist in Fayetteville, NC, Dr. Angela Ruff, has a few tried and true ideas. Read on to learn how your can make daily oral hygiene a pleasant and dare we say fun activity for the whole family! Even before you and your child need to brush, there’s a fun activity to be had at the store. Let your son or daughter choose his or her own toothbrush. Today, there are children’s toothbrushes with Disney princesses or super heroes that save the world! There are even toothbrushes that play music, too. Once they’ve chosen a toothbrush, then it’s time to select their favorite flavor of toothpaste. Nowadays, there is so much more than mint. They can brush with a variety of tasty flavors including strawberry, watermelon or bubble gum. Before brushing their own teeth, let your children practice on a favorite stuffed animal or doll. Show them how to brush the teeth in front as well as the back. Finally, you can even let them practice on your own teeth. Just be sure to brush again on your own later. Even if it’s not your bedtime yet, you can still join your child in their nightly oral hygiene routine. There’s no better way to set a good example than by brushing your teeth right along with your kids. If you have snack afterwards, there’s never any harm in brushing your teeth again. There’s an app for everything, and that includes teeth brushing. You can download the Brush DJ app for the iPhone or Android that will allow you to brush and dance to the rhythm of a snappy tune. The music stops after two minutes—the recommended length of time for good brushing. Another app is Star Teeth, which tells an engaging story while encouraging children to brush for two minutes. There’s absolutely nothing wrong with occasionally rewarding children when they do a great job of brushing their teeth. The reward doesn’t need to be expensive or elaborate. Just a little something that keeps them motivated to continue brushing well. 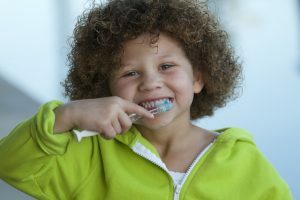 Dr. Ruff and her team can help you come up with other ways to encourage your children to brush. We also want to see them at least twice a year for dental checkups. Call us for more tips or if you have any tips that have worked for your children. To schedule an appointment, call our office today.